The Cape Winelands are food and wine heaven. Beautiful views, amazing restaurants, stunning wines…only problem (if it can be classed as a problem) is there are so many wine estates. Seriously, it can get very intimidating deciding where to try next. So I calmed down and, with a little help from my friends, decided to tackle the project one road at a time. So we headed down the N2 towards Somerset West and turned left onto the R310 into the beginning of the Stellenbosch Valley (marked with little bunches of red grapes on the map). Almost immediately we took a right down a windy gravel road to our first port of call, Vergenoegd (it means satisfaction has been achieved). 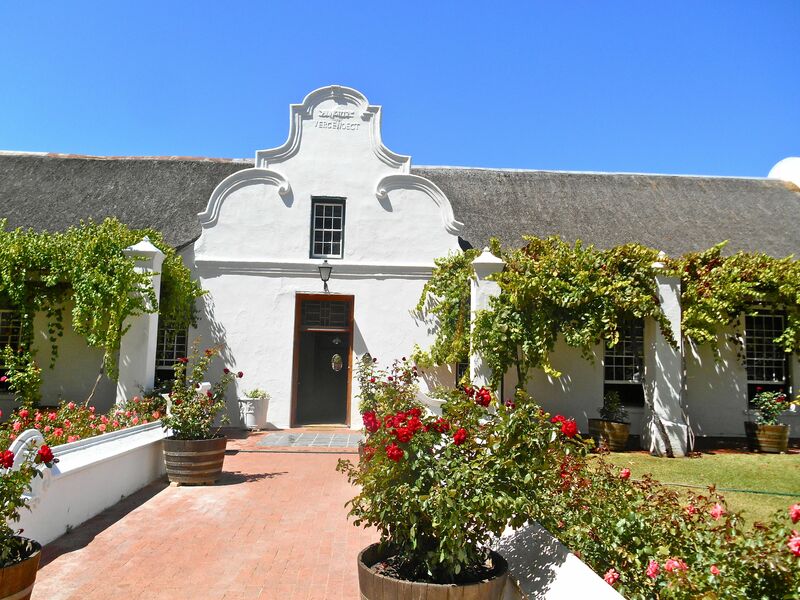 Owned by the Faure family for six generations, the homestead is an historic monument that dates from 1773. We were greeted by loads of ducks (they are an important part of the pest control in the vineyards) and a large group of people playing boules under the trees. The welcome is warm in the tasting room where we fell in love with the Terrace Bay red blend (R90) and the Shiraz (R115), great value for lovely 2005 vintages. First purchase made! There’s also the Pomegranate restaurant which has an intimate feel and al fresco views of the lake (and the ducks). Just up the road (the next right turn off the R310) is Meerlust. 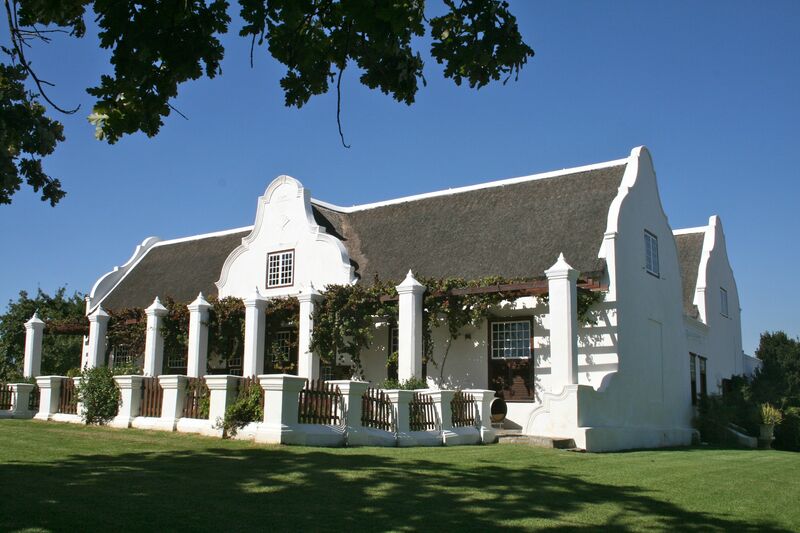 The estate has been the pride of the Myburgh family since 1756 (for eight generations). Wow, there’s certainly a lot of history around here. There’s a historic manor house, classic wine cellar and bird sanctuary to visit. The award-winning wines are noted for their exceptional complexity and character. I love the Rubicon which is a blend of cabernet sauvignon, merlot, cabernet franc and petit verdot. Continuing down the R310 deeper into the valley you come to Spier. Also one of the oldest wine farms in South Africa (1692), it’s a totally different creature. 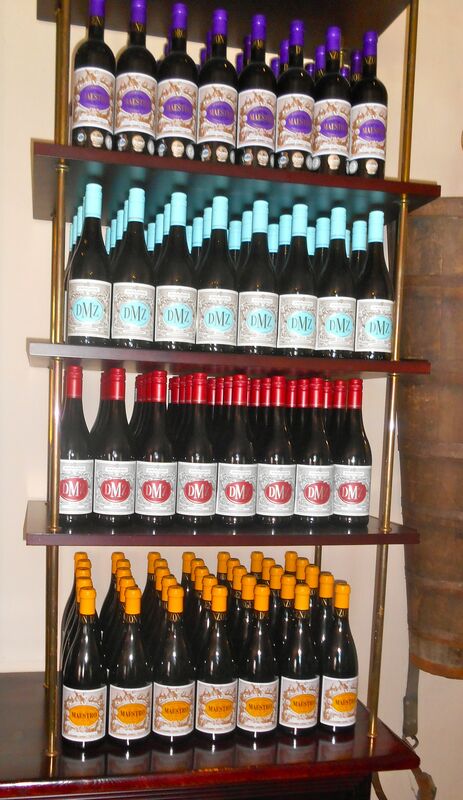 The estate has been developed to offer all the usual wine-related stuff and more. There’s wine tasting and three restaurants (plus a picnic) and on top of that you can enjoy segway gliding vineyard tours, eagle encounters (the birds of prey are crucial in keeping the farm’s ecosystem in balance), find out about biodynamic farming and shop in the craft market under the trees. You can also stay in the hotel and visit the spa. Okay, it’s a big commercial enterprise (the first thing they suggest you do is pick up a map!) but is a great day out for the family with something for everyone. Next stop, De Morgenzon, once you’ve crossed the M12 and headed even deeper into the valley. The name means “morning sun” as it is the first part of the Stellenboschkloof Valley to see the sun because of its high altitude and aspect. The estate was purchased by high-profile South African businesswoman Wendy Appelbaum and her husband Hylton in 2003 (you can see their house right on top of the hill). The estate has been transformed since then as you can tell as soon as you drive through the gates with their magnificent crest. We sat out on the verandah looking out towards the amazing gardens to taste a really great range of whites. And we fell in love with the beautifully designed labels! The last stop at the very end of the winding road is Jordan which is relatively new compared with the historical estates we’ve visited along the way, so the buildings are all very contemporary. Highlights here are the amazing George Jardine restaurant (see previous post), a newly opened bakery full of tempting treats, lovely wines and, of course, the spectacular view. The perfect place to finish up and chill out after a hectic trail of wine tasting! 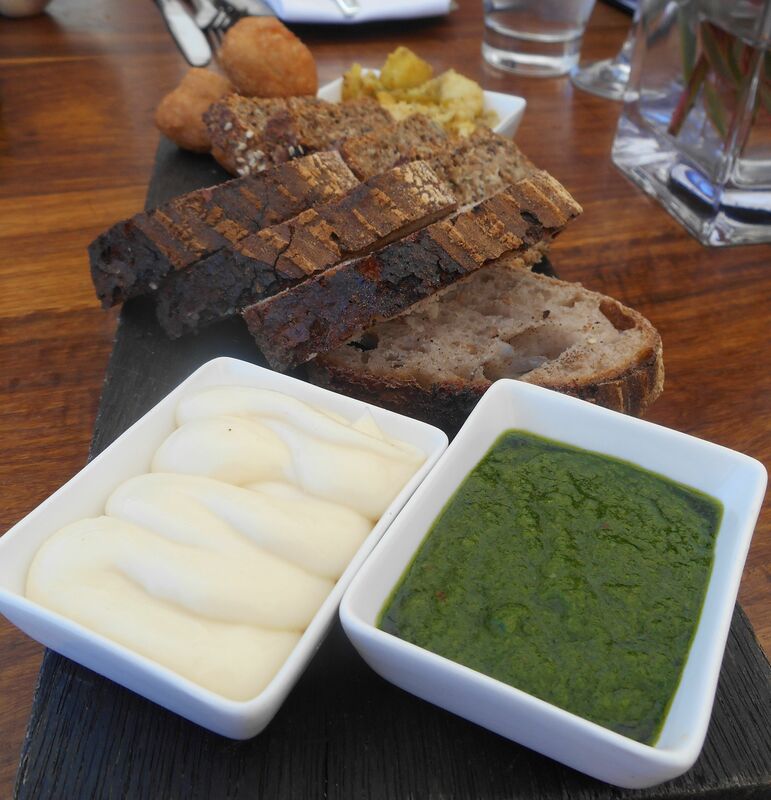 Here’s the amazing bread we were served on arrival at Jordan with garlic mayo, chimichurri and morsels of tasty pickled fish. So there you go, a mini tour of what is really two short roads in one of the many designated valleys in the wineland. A wonderful way to spend the day in what must be some of the most spectacular scenery in the world. Where to next? 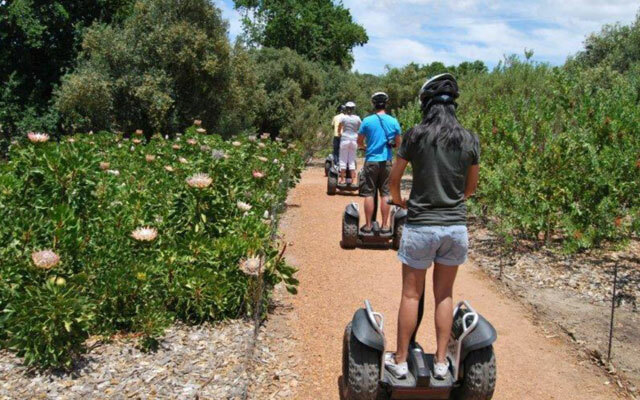 Do you have a favourite route in the Winelands? Or a favourite vineyard? Let me know, any help with wineland decision-making much appreciated. Try Thelema Mountain Vinyard at the top of the Helshoogte Pass on the R310 – fabulous scenery and wine to die for! Thanks Pamela,I know the Thelema wines well,they are so stunning. Will need to plan our next adventure.